Executive Garden Rooms are an experienced name in designing and building bespoke garden granny flats. They offer their clients a complete project managed service from design conception right through to handing over the keys to the new home. There are no standard designs; they work with each family to create the perfect size and layout and to decide on the specification and design features. After the initial design process, they handle the planning application process and organise building control approval. The Executive Garden Rooms team then manage all aspects of the build from initial groundworks through to final decoration. Executive Garden Rooms were recently commissioned to design and build a self-contained home for their client’s mother. The lady wanted to be able to live independently but with the peace of mind that family members were nearby. An L-shaped design sitting on a footprint of 10 meters wide by 7.5 meters deep was decided on. A spacious, open plan kitchen living room has been created with a double bedroom and a good sized shower room leading off the main room. A modern, well-equipped kitchenette has been fitted. The U-shaped configuration of the units is a clever use of space. Offering plenty of workspace and a breakfast bar area for eating. The kitchen fittings include an eye level oven and induction hob with extractor fan above. A fridge/freezer has been incorporated, and there are ample storage cupboards. A 125 litre pressurised water cylinder has been fitted in the annexe to supply the kitchen and shower room with hot water. Executive Garden Rooms are one of only a few companies that go to the lengths of incorporating such systems. There are many benefits to incorporating this type of system, for instance, consistent water pressure – no fear of being in the shower and someone in the main house turning the tap on and your shower petering out! Also, a handy airing cupboard has been created. A spacious shower room has been created. A large shower tray with glass screen has been fitted. A Mira mixer shower was chosen with a large shower head and also a handheld showerhead. A contemporary vanity unit sits alongside the toilet, and a heated towel rail has been fitted. 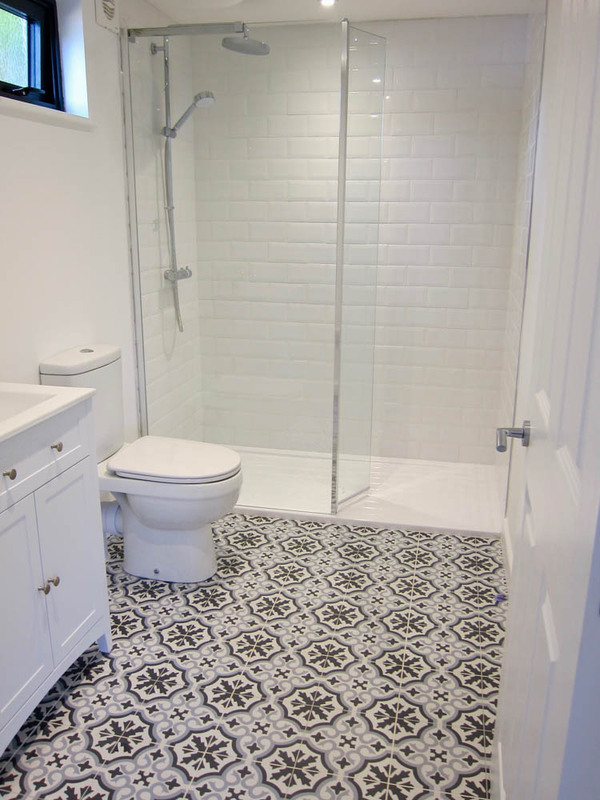 A stylish tiled floor has been laid. The granny flat is highly insulated. Rigid foil backed insulation was used throughout with the walls featuring an impressive 140mm of insulation, and the floor and roof each featuring 100mm. Coupled with the double glazing in the aluminium framed doors and windows the annexe will be easy to keep warm. In fact, it was calculated that with so much insulation, two electric wall panels in the main living space, one panel in the bedroom and the heated towel rail in the shower room were more than enough to heat the building comfortably. The roof of the annexe has been finished with a sedum roof. The blanket of plants is installed as part of a multi-layer build up. Sedum roof coverings not only offer visual interest all year round. They also add a further layer of thermal insulation to the structure. In addition, they absorb moisture and carbon dioxide and provide an interesting habitat for birds and insects. As we can see, the different plants look great and will only improve as they become more established. Sedum roof coverings require little maintenance to stay looking good. Two different external cladding materials have been used on this building. To comply with Building Regulations, because the annexe is sited within 1 meter of the boundaries, the side and rear walls have been clad in fireproof Cedral boards. This is a cement based product that is pre-coloured and maintenance free, but more importantly has a low fire rating. The front walls have been clad in Western Red Cedar. Cedar cladding is hugely popular but if left to weather naturally, will turn silver grey. The change in colour from its original reddish brown can be uneven, and people report being disappointed in the change of appearance. A UV-oil can be applied which slows down the weathering process dramatically. Executive Garden Rooms had a UV-oil applied in the factory before fitting, ensuring that all surfaces of the board are coated. We have used UV-oil protected Cedar here at Garden Room HQ and can report that it does halt the weathering process. We top up the oil every couple of years and find it quick and easy to apply. As part of their project managed service, the Executive Garden Rooms team handled all the groundworks associated with the project and had them signed off by Building Control. These groundworks included installing the reinforced concrete foundation and digging trenching to connect the water, sewerage and electrics to the mains supplies. 25 meters of trenching were dug, and the groundworks included installing a pumping station. The Executive Garden Rooms team feel that this is a more robust solution than using a macerator which have long term maintenance issues. How much does a garden granny flat cost? This project managed build was fully completed in 6 weeks. The project cost £92,000 which is impressive when compared with the £235,000 a one bedroom flat nearby would cost. That works out at £1,695 per square meter. It is important to note that this is the price for the complete, move in ready project. Some companies offering garden granny flats only install the building leaving you to organise the groundworks and mains connections separately. As the groundworks and mains connections are a lot of work, this can be a significant hidden cost, so it is worth working with a company who offers a complete turnkey service as you will know where you are from the get go!